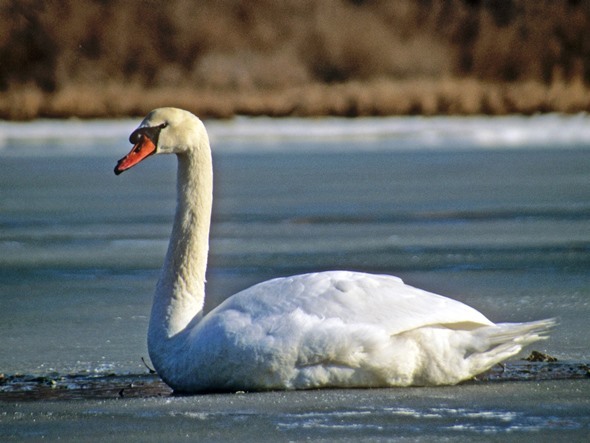 Mute swans, like this one photographed on Hallock Bay in Orient, NY, feed on subaquatic vegetation and can eat up to eight pounds of sea grasses per day. Photo by Felicia Scocozza. Bird watching in the dead of winter? Isn’t that usually a warm weather endeavor? Well, maybe for the casual backyard birder, but for those who head outside in search of anything from owls to hawks, mergansers to harlequins or even chickadees to nuthatches, winter is prime time. 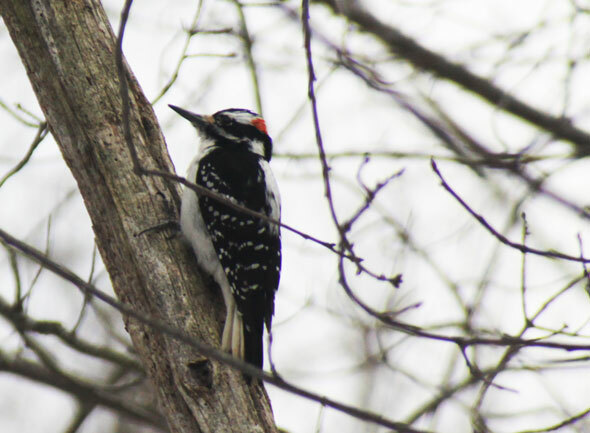 The hairy woodpecker is a common sighting in wooded areas during the winter months. Photo by Felicia Scocozza. Winter birding may be fun, but it is also cold. Dress in layers, starting with thermal undergarments, a warm shirt, sweater or sweatshirt, and a coat that will block the wind. Top it all off with a knit hat and scarf. A good pair of hiking boots are a plus, and absolutely necessary if your search will take you near the water. Water resistant gloves are also essential. Don’t weigh yourself down with too much gear on your bird watching excursions. A pair of binoculars are essential and a spotting scope is a big help, especially for identifying sea birds far off the beach. Bring along some small snacks and something to drink as hiking to the best spots for viewing may make you hungry and thirsty. Many birders prefer to leave their cameras home believing it better to concentrate on the birds themselves than f-stop settings. Half the fun of any birding trip is checking off species you’ve seen for the first time. Carry along a small note pad for scribbling down notes and sightings. Then transfer details to a more formal birder’s journal when you return home. There is no shortage of birding resources available these days. Novice bird watchers will find that Peterson’s Field Guide is easy to follow, as is the National Audubon Society Field Guide to Birds, Eastern Region. The Kaufman Field Guide to Birds of North America is also a terrific source, especially for its description of bird songs and their calls. Intermediate and advanced avian fans may prefer the Sibley Guide to Birds, or The Field Guide to Birds of North America by National Geographic. If you prefer to research on-line, check out www.audubon.org, or the more local www.libirding.com. Almost any waterfront area sporting a stretch of undeveloped coast will attract ducks and sea birds. Fields and woodlot edges are also excellent encounter points and may reveal upland game birds including bobwhite quail and pheasant. Hawks tend to patrol large fields while great horned owls relish the deep, dark woods. As you might expect, parklands make great starting places. Keep in mind that this is a passive, non-consumptive sport. Watch from a distance that will not disturb, harass or stress the birds in any anyway. This is a great place to bring the family – or a date. Step onto the well-groomed 1.5 mile trail and hold out a palm full of black sunflower seeds. Within a minute or two tiny black-capped chickadees will land on your fingers to accept their free lunch. The key is to keep your arm outstretched, hand flat, palm-up with fingers together and fully extended. Stand perfectly still and the birds will offer a terrific view of their varied blue plumage while you wonder how they can eat so much yet weigh so little. When you run out of bird seed, or your arms grow weary, continue on to spy loons, horned grebes, terns, osprey and, possibly, a peregrine falcon or northern harrier hawk. The trail brings you past varied habitat including pond, bay, salt marsh, tidal flats, kettle holes, grasslands and freshwater marshes. Established in 1987, this transitional terrain lacks a primary water source but sports over 850 acres of fields, pitch pine and woods – along with the second largest oak brush plains remaining in New York State. The Tomkos have recorded over 100 species of birds at this location, including great horned owls, red tailed, coopers and sharp shinned hawks, bobwhite quail, whippoorwills, blue birds, American woodcock, various wood peckers, fly catchers, threshers and a mix of warblers. At 423 acres, this park surrounds Massapequa Creek and sports a great hiking trail. The mix of woods, brush, creek and ponds draw plenty of feathered visitors. Expect to see titmice, woodpeckers and chickadees, snipe, ring necked ducks, pintail blue-winged and green-winged teal, mallards, wood ducks and plenty more. Be sure to return here in late September and October next year to intercept the hummingbird migration. The speedy little fliers come to sip nectar from the flowers of blossoming jewel weed, wetland plants which look like orange inpatients. Many veteran birders believe Montauk Point to be one of the best bird watching spots in the country. During the winter thousands upon thousands of sea ducks and gulls stop here, including uncommon or rare ones like the thick-billed murce, Atlantic puffin, king eider or Harlequin duck. Start at the concession stand and work around the south side bluffs all the way to Camp Hero to see all three species of scooter and common eider. Before heading home, check out Montauk Inlet off East Drive for an interesting mix, the rocks near the easternmost parking lot at Ditch Plains for Harlequin ducks, or Culloden Point for red neck grebe. For a frequently updated listing of guided bird tours on Long Island, as well as additional tidbits about birds, visit www.libirding.com. For a listing of Audubon Society Local Chapters visit www.audubon.org. Start at the Coast Guard Station and walk the surf line, then along the bay to spot piping plover, long-tailed ducks, loons, common mergansers, red breasted merganser and grebes. Harlequin ducks can be spotted from Point Lookout Town Beach. Start at the bird feeders near the Visitor’s Center, then explore tidal and freshwater wetlands to view various ducks and sea birds. East Pond holds scaup, brant, mergansers and canvasbacks. Marsh and bay near West Pond feature grebes, scaup, black ducks, buffleheads and, possibly, clapper rails. Fields contain short-eared owls, snow bunting and horned larks. 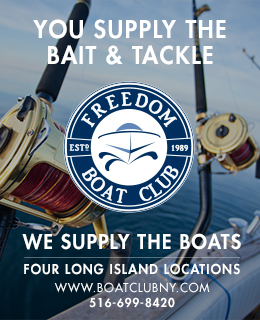 Long Island Sound beach, tidal mud flats, bird sanctuary, rolling meadows, wooded hillsides and marshes offer a wide variety of possibilities. Check the water spots for horned grebe, bufflehead, red breasted merganser, long tailed duck, plus common and red throated loons. Visit the fields near parking lots 1 and 2 to search for snow buntings, horned larks, cardinals, blue jays and hawks. With more than 3,400 acres to explore, this is a birder’s paradise featuring woodlands, fields and, of course, the elegant Connetquot River. More than 50 miles of trails and several ponds make for great viewing of bobwhite quail, ruffed grouse, woodcocks, pileated woodpeckers, whip-poor-wills, and warblers. Pheasants, wood duck and osprey are special treats. Stump Pond boat dock is great for viewing northern shoveler, American Wigeon, ring-necked duck and the spectacularly beautiful wood duck. Trails at north end of lake offer dark-eyed junco, swamp sparrow, white-throated sparrow, titmouse and nuthatches along with downey, hairy and red-bellied woodpeckers. A small lake with easy viewing and easy access. Not suitable if frozen. See mergansers, coot, shovelers, pintails, canvasbacks, mallards. Plenty of ducks, sea birds, hawks, and an occasional snowy owl. Park in pull-offs and walk the beaches.